The Netherlands Planning 2,300 Square Mile Wind Farm in North Sea, Generating 30 Gigawatts of Power for Six Surrounding Countries « Adafruit Industries – Makers, hackers, artists, designers and engineers! The wind farm at sea is focused around an artificial island complete with power station and airport (for getting resources to the island) and it will generate an astounding 30 gigawatts of power! (By comparison the now-shuttered Fukushima plant in Japan, at its time one of the 10th largest plants by power, generated around 4.2-4.7 gigawatts; even the largest plant – Kashiwazaki-Kariwa, also in Japan – only generates 7.9 gigawatts by comparison, so this wind farm will be nearly 4 times larger than that, and completely clean & renewable. The wind farm, at 2,300 square miles, will be about the size of Delaware, or twice the size of Rhode Island. Wow! There are plans afoot in Holland to build a gigantic offshore wind farm to produce a massive 30 gigawatts of electrical power. That’s right — 30 gigawatts. To put that in perspective, the average nuclear, gas, or coal plant typically generates about 0.8 gigawatts, so this venture will be about 40 times as great. 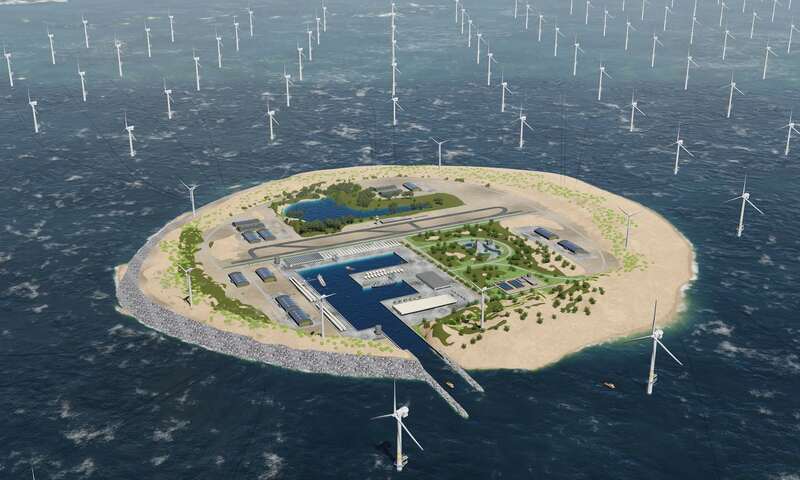 The project entails building a 2,300-square-mile complex in the North Sea centered on an artificial island, which, as described in The Guardian, will itself be 5 or 5 kilometers in area and will serve as a hub for thousands of wind turbines. The precise location of the complex, the Dogger Bank, is actually closer to the U.K. than to Holland itself. 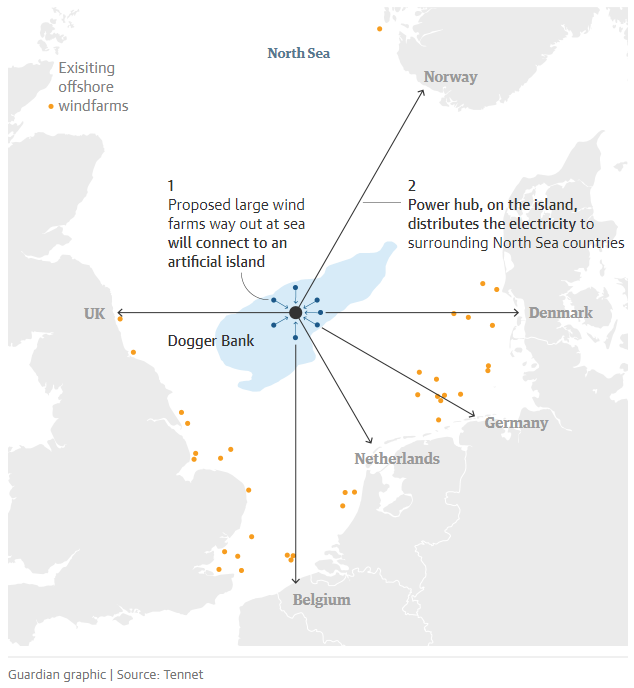 By way of comparison, the largest offshore wind farm existing today is the London Array, which, according to Quartz Media, takes up 47 square miles and generates about 0.6 gigawatts of power.